With the ever increasing difficulty to mine Bitcoins it gets harder and harder to actually make a profit as a Bitcoin miner. However not too long ago the most powerful and efficient miner to date was introduced – The Antminer s9. The Antminer s9 has a hash rate of 12.93TH/s -+ 7% (and not 14 TH/s as advertised sometimes), which means that it can generate around 0.5 Bitcoins every month. This is of course only revenue and not taking into account the electricity, mining pool fees, or hardware expenses. I ran the numbers against 3 different Bitcoin mining calculators and they all show the same result. Around $330 a month of pure revenue (at today’s exchange rate this equals around 0.5 BTC). The Antminer S9 is also the most efficient miner on the market. This means that it wastes the least amount of energy than all other miners out there. If you add into account electricity cost as well you will generate a little less than that – around 0.33BTC. The price of the Antmier s9 varies a lot. On Bitmain’s site you can buy it for $2400 or at a similar price on Coinminer. On Amazon you can find it for as little as $2700 and on eBay you can get it for as little as $2000 (so that’s probably the best place to look). This is the most expensive miner on the market today because its superior mining abilities. In order to break even with your investment you will need to mine for about 10 month taking into account an average electricity cost of $0.1/KW. 10 months is a long time in the Bitcoin universe and a lot can change – mining difficulty can rise, exchange rate will fluctuate and all of these make it hard to predict how long will it actually take to break even in this investment. The Antminer s9 can’t just be plugged into the wall, it needs a PSU (power supply unit). 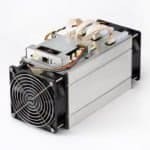 So whenever you purchase an Antminer keep in mind that you will need to spend and additional $150 on a PSU. Bitmain (Antminer’s manufacturer) recommends using APW3-12-1600-B2 which can be found on their website, on Amazon or on eBay at different price points as well. If you own a PSU of an old Bitcoin miner you might be able to use that as well. For example the EVGA SuperNOVA 1300 Watt GPU PSU should also work with this miner. However if you don’t already own a compatible PSU it will probably be best to just buy the APW3-12-1600-B2 and add it to your initial investment cost. It probably won’t cost much more than any other old PSU you can find. My overall rating is a 3.5 since these don’t deserve a 4. These are great miners that can replace about 3 s7s. However, the miner gets way too hot over the s7s. I can easily run my 5 s7s in my garage in florida at 55% (which I have to because any higher and they make a loud whinny noise) while these are kept at 100% and still get too hot. I can easily keep these at 100% with no whinny noise issue and are more quiet than the s7. If you do want to use the s9s then they will have to be in a much better controlled environment(which I will have to come up with) if you want to keep these lasting longer. If you do go down this path though it’s important to recalculate profitability as the Antminer s7 is less power efficient than the s9. Here’s a complete comparison of the Bitcoin mining hardware available. Bitmain delivers their Bitcoin miners in batches. Every batch is different than the other and also has a different hash rate. So it’s extremely possible that you’ll find yourself buying an Antminer s9 that has a hash rate of only 11.85 TH/s and not 12.93 TH/s. That’s why it’s important to know the specifications of the exact miner you’re looking into before buying it. For example, the current batch of Antminer s9s available from Bitmain are only 11.85TH/s, the more powerful models are sold out. However, on eBay you can still find people selling the older more powerful model. Keep in mind that the 11.85TH/s models are also priced lower than their bigger brother, so it’s not like you’re getting ripped off or anything by buying that model. Bottom line – make sure to know the EXACT specifications of the miner you’re buying. This way you will know to calculate the exact ROI and when you will break even. Bitmain supply their customers with a 90 day warranty, however that warranty comes with limitations. For example, the warranty won’t be valid if you overclock the miner (running it at a higher speed than it was designed to run). Also, if you use an inappropriate power supply or generate environmental damage to your miner you won’t be eligible for a warranty (e.g. lightning strike, corrosion due to wet environment). Some eBay sellers will also supply you with a warranty so make sure to read the details on each listing careful. Bottom line – is the Antminer s9 worth it? Also there’s always the question of the increasing difficulty and how much time will pass until the Antminer s9 becomes obsolete (usually this happens within 8-12 months). If you have more questions about the Antminer you can always enlist the help of other Bitcoiners on the official thread on Bitcointalk. Happy mining!